Eggs house several vital nutrients; 13 essential vitamins and minerals, fat, and a protein that is hundred percent absorbed in the body. In cooking as well, eggs find various applications and hence eggs are a good choice to include in non-vegetarian and ova-vegetarian diets. However, eggs could be exposed to unfavourable conditions during production, transport, handling and storage. 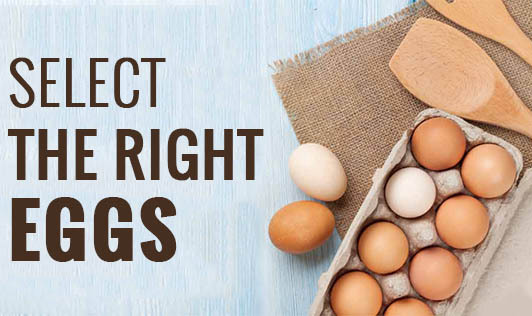 It is extremely important to consider certain dos and don'ts while purchasing eggs. 1. Self-serve eggs (selecting eggs from a displayed bulk) are not a good idea at all since there are no indications about the source, storage conditions and an expiry date. Always select egg cartons. 2. Be sure your egg cartons are placed in clean and hygienic refrigerated conditions at the purchase place as well as when you store them at home. 3. Eggs must not be exposed to moisture or washed as this can lead to bacterial contamination and early spoilage. 4. Larger the eggs, thinner and more porous the egg shells and hence shorter the shelf life. 5. Don't forget to check the "best before date." 6. The egg shell must be free of stains, cracks, spots, and dirt on the surface. 7. Heavier the egg, more freshly produced it is. 8. Candle your eggs or hold them against bright light. This helps you analyze the yolk and white positions and consistencies, and the presence of blood stains within. The absence of spots and stains and centre position of the egg indicates that the egg is fresh and of good quality. This is because as the egg ages, the yolk gradually moves towards one end. 9. Use eggs as quickly as possible. 10. Let your eggs remain encased in the cartons even when refrigerated to preserve them for longer. If not taken care of, eggs can be spoilt by the action of bacteria and molds and can lead to food borne illnesses.